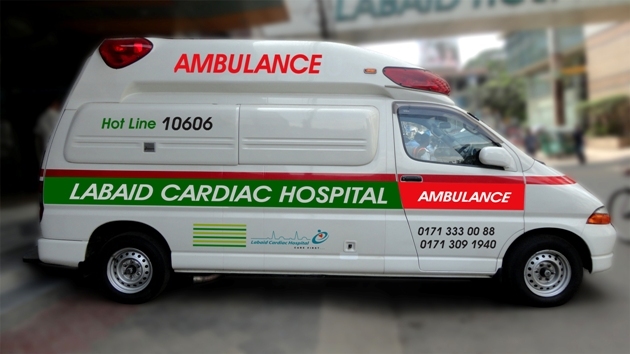 The Ambulance service at Labaid Hospital provides emergency support to patients who require it. In order to bring patients who call for ambulance they need to provide their home address and or telephone and cellphone number to the ambulance drivers. Also, the Emergency department, customer care and call center extend coordinated efforts to bring the patient from the patient’s residence. In case of patients being discharged from hospital ambulance is provided to the patient where emergency department takes initiative. If the patient dies during the course of management utmost effort is extended to carry the dead bodies to desired destinations. The Ambulance service maintains a high level of coordination between the Emergency department and other concerned departments like customer care, duty stations etc. In the near future we are going to operate Ambulances with cardiac support to facilitate patient’s support system. We have Ambulances in different branches of our hospital including Gulshan, Uttara, Old Dhaka and Mirpur aswell as Chittagong and Sylhet.